Sometimes, Snack Girl goes on a food jag. Her latest is apples. I get obsessed with a particular food and need to cook with it all the time. Perhaps it is because I have a yard with some apple trees that are looking beautiful right now. 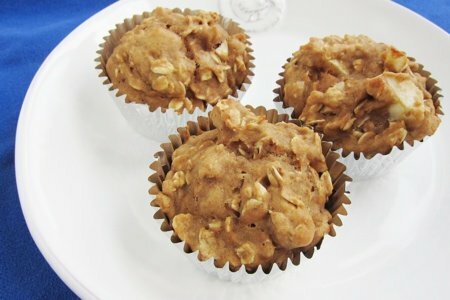 I decided to make an apple oatmeal muffin because it sounded good and my children are always demanding muffins. Of course, the ones they want are made with twice the sugar and three times the fat and white flour. BUT, they like these - enough to stop bothering me for muffins. These are fast to make – just one bowl – and if you are swimming in apples – you can freeze them for later consumption. I eat one with my afternoon coffee as a treat. They are a little too sweet to have as the only food for breakfast. I would, of course, pair them with an apple and peanut butter since all I can think about is apples. Preheat oven to 375 F. Line a 12 muffin tin with muffin wrappers or spray with nonstick cooking spray. In a large bowl combine flour, oats, baking powder, baking soda, salt, cinnamon, ginger, nutmeg and sugar. Add applesauce, oil, egg, and vanilla and mix until blended. Fold in apple pieces. Divide batter into 12 muffin cups and bake for 16-18 minutes until knife inserted into center is clean. These can be frozen and will be fresh for one month. Muffins are a great on the go breakfast. I eat muffins, yogurt and granola or oatmeal just about every morning. If you could provide more lower fat muffin recipes I would love it. I get the ones at Trader Joes and they have 5 grams of fat in each. I am getting tired of them and want to bake my own! I will try these, thank you. Why not eat them with the nut butter right on them? This seems like a wonderful and fairly healthy recipe to try for my kids. It sounds delicious! I'm always looking for great recipes that use apples. Thanks for the recipe. Thanks for a nice fall treat. Due to my recently acquired dislike for gluten, I'm going to try these with Almond flower and maybe also Quinoa flour. Can't wait! SG, these muffins look delish and perfect for fall! Thanks for a great recipe. These are good, and they freeze/reheat well (I did it in the microwave). I added half a cup of walnuts for crunch, will put in even more next time. Just popped some in the oven! (Hopefully I made them right and my little oven doesn't burn them lol) Thanks for these recipes! Love apples! I made some apple muffins almost identical exactly to your recipe only difference was mine had no oatmeal but one more apple though. YUMMO! YAY to apples! These are easy and yummy. I used a half cup of applesauce that was sweetened with Splenda and one quarter cup of oil and the same of plain yogurt. Came out great. I don't peel my apples for anything except applesauce. Less work, more fiber & vitamins, and no one has noticed.